We would love to have you come and stay with us, and hope to meet you in the future. 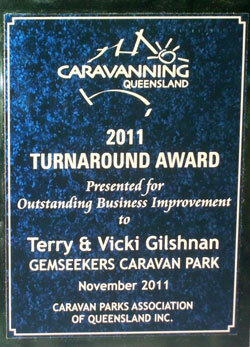 Relax in the natural, peaceful bushland setting, of Gemseekers Caravan Park. Bird Lovers Paradise, breath the fresh air and explore the many things to see in and around Rubyvale. Gemseekers is just 300 meters from the post office, hotel, shops, cafe, and all the Sapphire shops and mine tours. Ideally located in centre of the Sapphire Gem Fields - there are 8 designated fossicking fields where you can go and try you luck! Gemseekers Caravan Park offers a range of accommodation options including self contained holiday units, powered and non powered sites for Caravans. Cable T/V for all sites and free NBN Wifi through out park. Why not call in on your next trip our way and stay in the heart of the Gemfields. Gemseekers is not the park in the center of town.